Roof spraying protects your roof against leaks. Regular roof spraying is best practice for home owners. Roof spraying doesn't have to be done often, just every few years, and it's good to understand the issues. 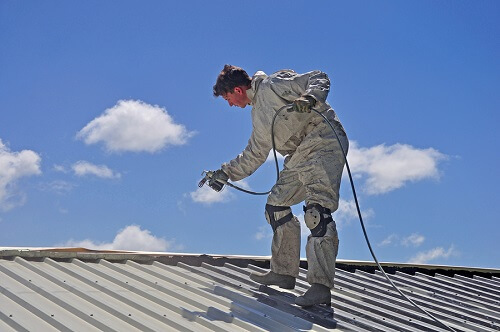 Roof spraying is effective for all round protection: Spraying ensures that microscopic leaks and intrusions to the interior roof are prevented. Water finds its own levels in roofs, too, and will exploit any opportunity to seep in. Roof repairs or roof restoration, if necessary, are the best options in cases where developing leaks are found. Roof tiles need protection, too: Minor cracks or damage in roof tiles, even on a microscopic level, can be big trouble. Spraying the roof tiles protects them against further damage. If you look at a new roof, you'll notice that it looks a little shiny, but looks good. The overall look is consistent. Now look at an older roof: it looks patchy, with some areas looking in better condition than others. You may still see some of the new look, but there are areas where the roof is clearly looking like it's taking on more wear and tear. Discolouration: The roof surface has taken rain, debris, and sunlight which have caused the previous roof spray to deteriorate. In some cases, discolouration may be caused by birds, or surface marks from storm damage. It's best to get these problems checked out when you get your roof sprayed. Spots on the roof: These are usually lichens, which have managed to penetrate the roof tile’s surface. This is quite common in older roofs. In these cases, the roof tiles haven't been sprayed for some time, and desperately need a new spray job. Roof cleaning will also be required. Terracotta tiles: Terracotta tiles are very good for spotting spray issues. Because these tiles are a lighter colour, any inconsistencies in the surface indicate that a new spray job is required. Roof paint issues: If your roof paint is looking worse for wear and uneven, the surface has been compromised. Fortunately, roof paint also acts as a protective barrier for your roof, and these problems are likely to be minor as long as the roof doesn't deteriorate further. You will need to repaint, as well as respray your roof. Obviously, if there are existing surface problems with the roof, a spray job should be done immediately. Otherwise, getting a spray job every five years is probably a good rule of thumb for scheduling your roof sprays. Over this period of time, it is inevitable that the roof surface will take some damage. Roof spraying seals the roof, and prevents possible further damage simply and cost-effectively. Need a Roof Spray in Wollongong or Sutherland? ReKote are your local do-everything roofing company in Wollongong and Sutherland. We can also help you with roof repairs. Call Re-Kote for any services you need on the numbers below, or complete our online form for fast service. Don't work alone! All professional roofers work with at least one other person. This is done as a safety precaution, to ensure that help is immediately available if someone working on the roof gets in trouble. Professional roofers are licensed tradespeople that possess the right qualifications and years of experience. Even the truly expert DIY people are at a real disadvantage when spraying roofs. This simply isn't the sort of job you can learn overnight. You can do a lot of hard work spraying your roof, and find that there are still problems with leaks and sealing issues. It really is better to leave it to the professionals. Renovating, building or upgrading your home is an exciting time. There’s so much to do, so many options to consider and a lot of little projects to undertake. One important topic that you may or may not have considered is painting your roof. If you are installing or repairing a tiled roof, you’re going to want to give it a nice new coat of paint. But not all roof tiles may be suitable for painting. Let’s take a look at the ones that are. Terracotta tiles are natural roofing products that are made in a kiln. They provide a traditional Mediterranean look, are all natural, and they tend to last a long while. They provide exceptional fire resistance and offer some wind resistance, too. Terracotta comes in two kinds – glazed and unglazed. Both sorts can get painted, although some people prefer to keep their natural shade. If you do paint your glazed tiles, use a high-pressure water gun to remove any residual moss. Then apply a primer to prepare them for their new paint job. For your second coat, you will need to apply a sealer. Concrete is another choice for your roof. It gets made from a mixture of cement and sand and can come shaped to resemble traditional Terracotta tiles, slate or wood shakes. They also provide exceptional fire resistance. Concrete tiles can definitely be re-painted and re-sprayed to give your roof a makeover. Slate is one of the oldest types of roofing materials known to man. It comes made from natural rock and is dark-grey with a slightly irregular appearance. This gives it its own certain sense of charm and style. It’s a long-lasting, sturdy material that provides good wind and fire resistance. Slate tiles can be re-painted, provided they get cleaned well beforehand. This wooden roofing material is manufactured using rot-resistant timber. Although it provides good wind resistance, it is not really fire resistant. You can treat it with a fire-retardant coating, though. Wooden shingles are traditionally stained to be a certain hue, but they can also get painted. 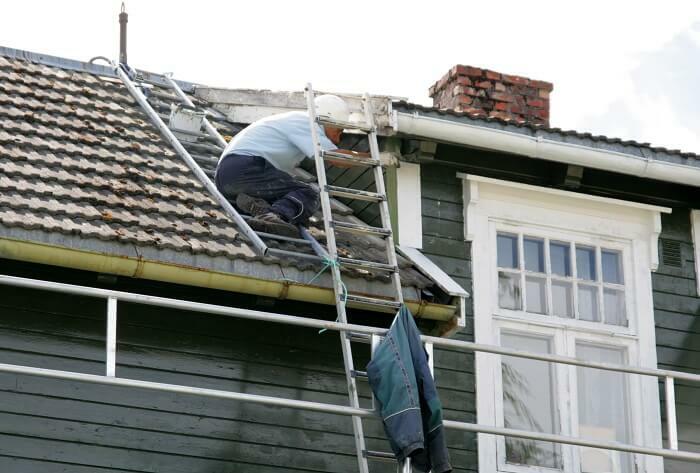 Painting shingles are actually the better option in many ways. Where a stained shingle will fade after three or so years, painted timber shingles will last for fifteen or so. Are you looking to paint your roof? Are you unsure if your tiles are suitable for a new paint job? Here at ReKote Roofing and Restorations, we have a brand new spray-on primer that will allow any sort of tile to get painted. We’re more than happy to drop by for a free quote. So please feel free to get in touch with one of our friendly staff. We are a professional roofing company in Wollongong with more than 30 years of experience!